Another Friday....Another Bloggers Challenge. This weeks challenge is a color challenge - pretty simple...Your colors are Brown (any shade), Sage Shadow and any neutrals. I had a few different Brown/Sage projects to share, unfortunately there was not enough light in my studio to take the other photos, so I'm just sharing this one piece I created using Stampin' Up! 's Fifth Avenue Floral. As with most of my creations, I did make a few versions before I finished my design. I randomly stamped the flowers from Fifth Avenue Floral in Chocolate and Sage on my Confetti Panel and Sage strip of card stock, then sponged the edges of Confetti in Chocolate and Sage in Sage ink. Used my SAMJ to stamp my sentiment in Chocolate, added the Faux Brads to my panel. The main flower image was stamped a couple times in Chocolate on Sage card stock, then cut out and popped up on dimensionals - to give it the 3D look. Did you know this stamp set has a matching Embossing Folder called Manhattan Flower (page 202 of the Spring Summer Catalog). Hopefully I'll get my samples posted this weekend to share with you using that die. Be sure to stop by the other challenge players blogs, I'm sure you'll be inspired by their work! It is stunning Lisa!!! I love how you layered the flower! Gorgeous! Very pretty card! Love all the layers! Lisa, that is one stunning card, with an outstanding composition. I have been sitting on the fence about that set and you just pushed me into a decision to get it! Really lovely work. I hope we get to see everything else you did with the challenge over the next few days! This is just beautiful!!! Love the layered flower and these colors are just awesome!!! Very Striking!!! 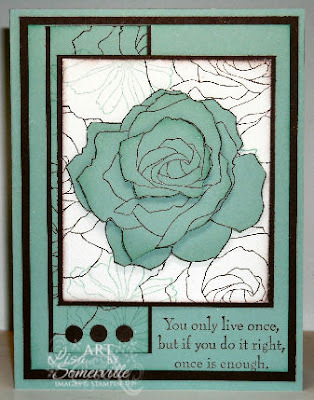 Love the Paper Tole on the rose! This is really pretty! I love how you cut the flower and layered it! That layered flower is gorgeous! Very pretty card, gf. TFS! So many of the BC group are using this stamp set! Time to get it off my shelf! Stunning creation, I love all the layers on your focal point! beautiful! 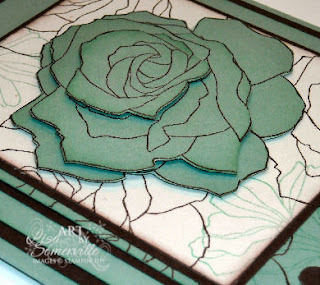 i love how you layered your rose...great job! I love the 3D flower especially with this layout!! Wowzers! That is really pretty. This is soo pretty! THe more I see of this set, this more I love it. OMG Lisa, I love it!!! I still have this set on my wish list, but you're enticing me to get it now..stop it! No, really. This is gorgeous. I love the layers. I've seen this set a few times and it is growing on me pretty quickly. Hope it comes to Oz with our new catty next month! Beauitful card, you've used the colours so well. So pretty, Lisa! I love this set and the colors are perfect with it!